The digital revolution is now complete. The KTM RC Cup is designed to highlight the future of roadracing, and when Brandon Paasch clinched the championship at the MotoAmerica round at New Jersey Motorsports Park Saturday, he also took a step into the future by becoming perhaps the first motorcycle racer to broadcast his victory lap on Facebook Live. Brandon Paasch hoists the AMA #1 plate as the new KTM RC Cup champion and gets congratulations from second-place race finisher Jody Barry. Photo by Lance Oliver. Paasch, a 15-year-old from Freehold, New Jersey, arranged ahead of time for a corner worker to have his phone and a flag announcing the Facebook Live broadcast. When things fell his way and he clinched the title in style, by winning the race with a last-lap pass, Paasch was ready to share his triumph publicly. Prior to the victory lap, it was a typical KTM RC Cup race. Put a bunch of ambitious teens on equal machinery and you get pack racing at its best. For most of the race, eight or more riders battled hard but cleanly nose to tail. Paasch got the chance to clinch the title when Anthony Mazziotto III, also from New Jersey, ran off track and fell 10 seconds behind the lead group. Second place would have been enough to win the title, but Paasch put a pass on Jody Barry in the final series of corners to take the win. Benjamin Smith finished third. "It feels really great, especially to wrap it up with one race left to go," Paasch said. "I can go in tomorrow with no pressure and just go for it." 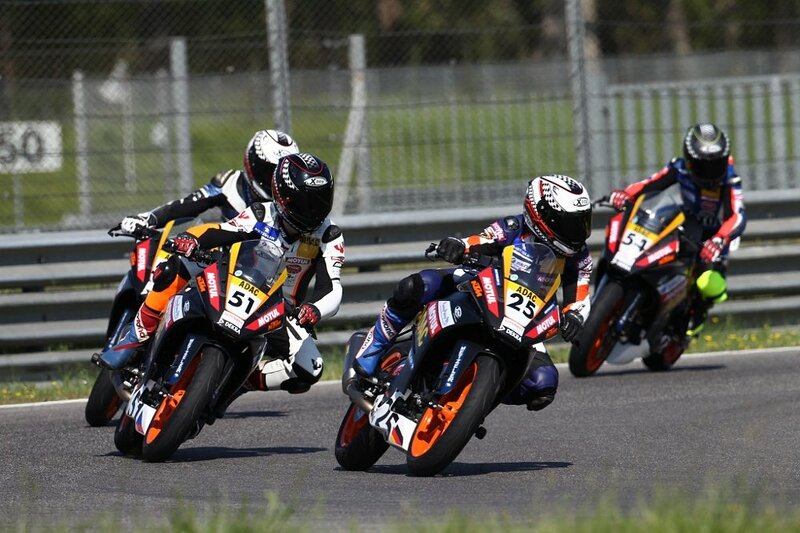 Even better yet, next month, Paasch, Mazziotto and Ashton Yates, son of former AMA Superbike racer Aaron Yates, will go to the famed Assen circuit in the Netherlands to compete in the KTM RC Cup World Final against top RC Cup riders from other countries.